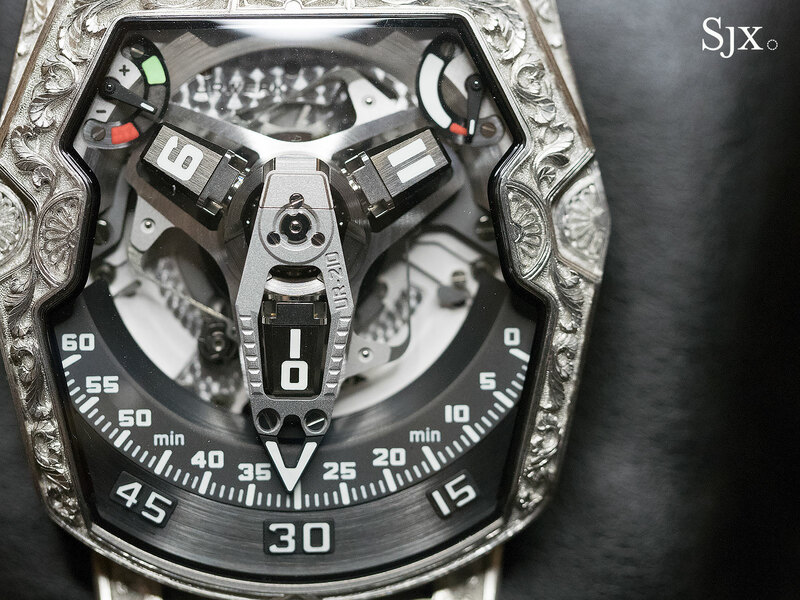 While Urwerk is best known as a pioneer in inventive and avant-garde watchmaking, particularly with the satellite cube time display found on the UR-210 wristwatch, a lesser known strand of its watchmaking combines mechanics with ornately decorated watch cases. 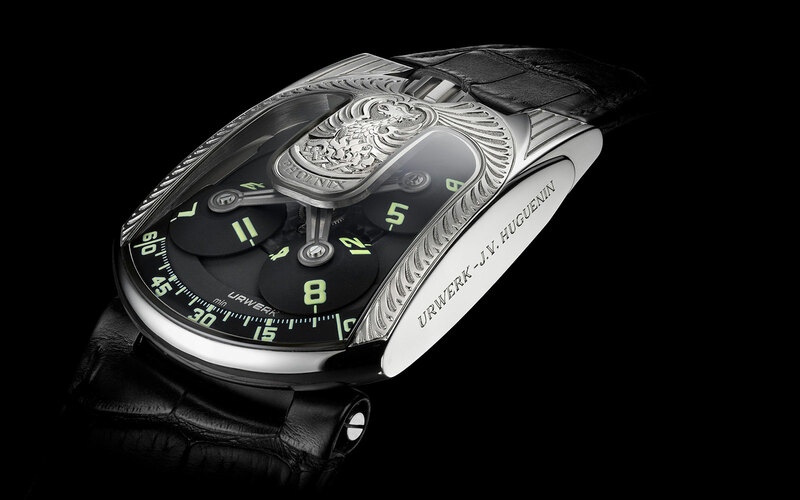 Engraved watches extend all the way back to Urwerk’s founding. 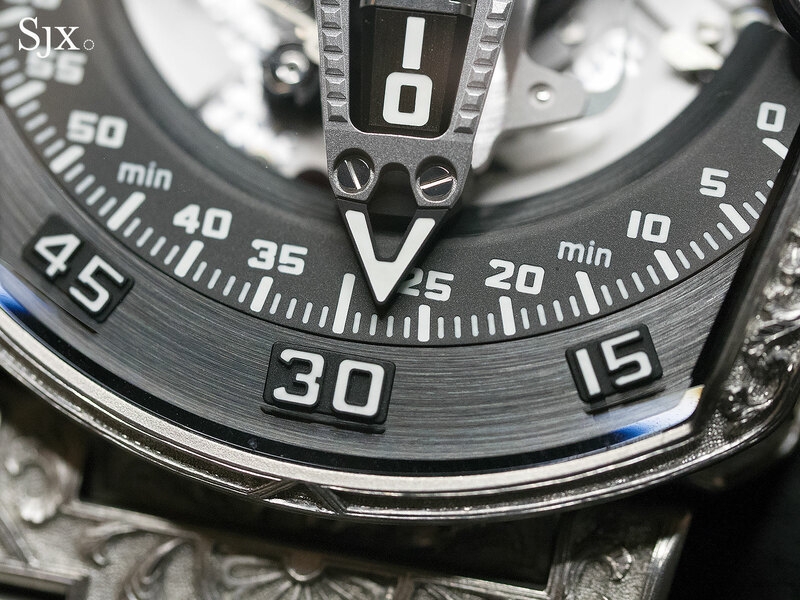 Sometime in the early 2000s, a one-off variant of its very first watch, the UR-101, was decorated with a repeating delta-shape motif and christened the Star Diamonds. 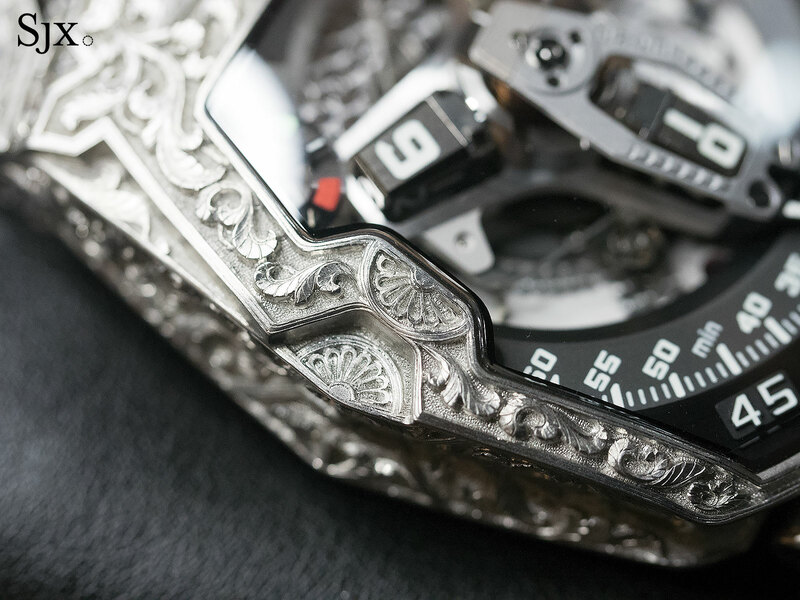 In those early days Urwerk relied on Swiss engraver Jean-Vincent Huguenin (who has worked for a diversity of watch brands from Blancpain to Hermes) for its engraved watches. 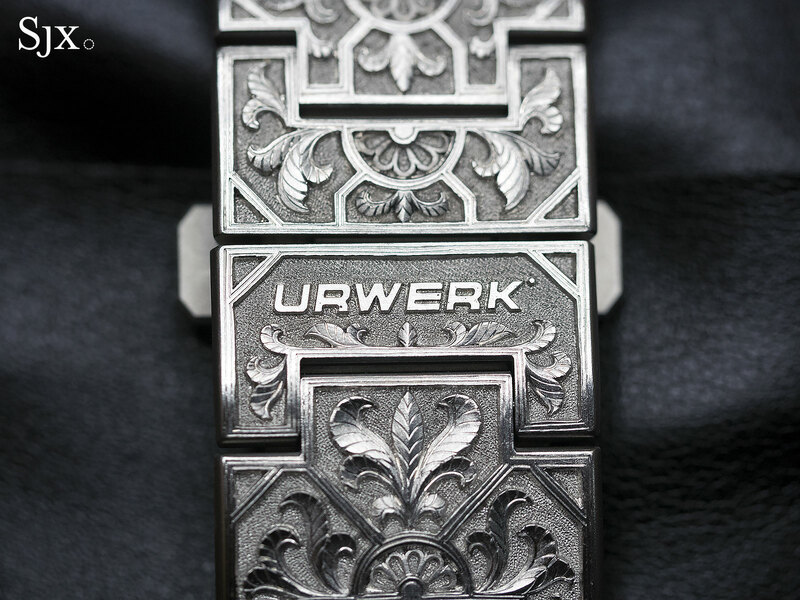 Mr Huguenin’s work was fairly versatile, but often centred on repeating geometric patterns, a style that was favoured by Urwerk itself in its first decade (recall the striped case engraving found on many UR-103 variants). Now watchmaker works only with Florian Güllert, which has given its watches a strikingly different style. 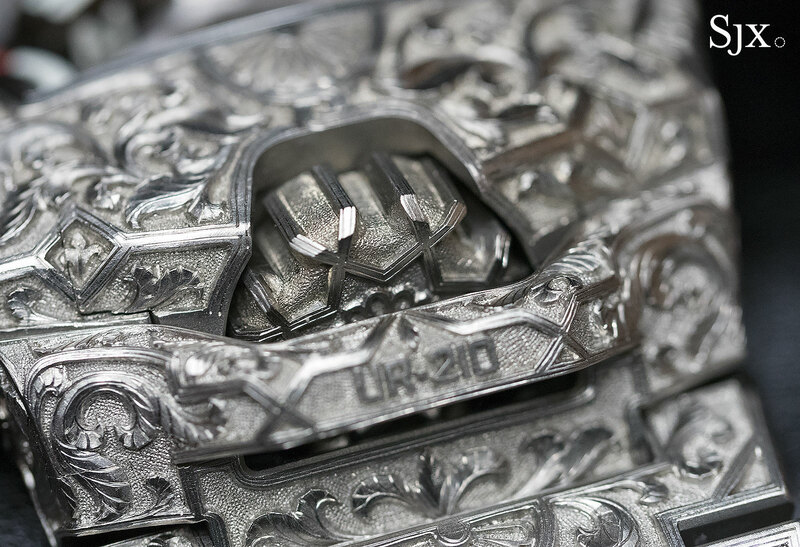 A young Austrian engraver who specialises in decorating high-end guns, Mr Güllert’s work for Urwerk is similar to what he does for firearms, except much smaller. Mr Güllert’s first creation for Urwerk was the EMC Pistol of 2015, and his latest is the UR-210 Dubai, made for Seddiqi & Sons, Urwerk’s retailer in the emirate. Based on the UR-210S, which has a steel case and matching steel bracelet, the Dubai edition is reminiscent of the UR-210 Amadeus, another fully engraved watch unveiled at Baselworld 2017. While the style is similar, the Dubai version features a decoration faintly inspired by the near East. Reflecting Mr Güllert’s background in gun engraving, the style of the UR-210 Dubai is elaborate and classical, with curlicues, acanthus leaves and the occasional fleur-de-lis, much of it in high relief. 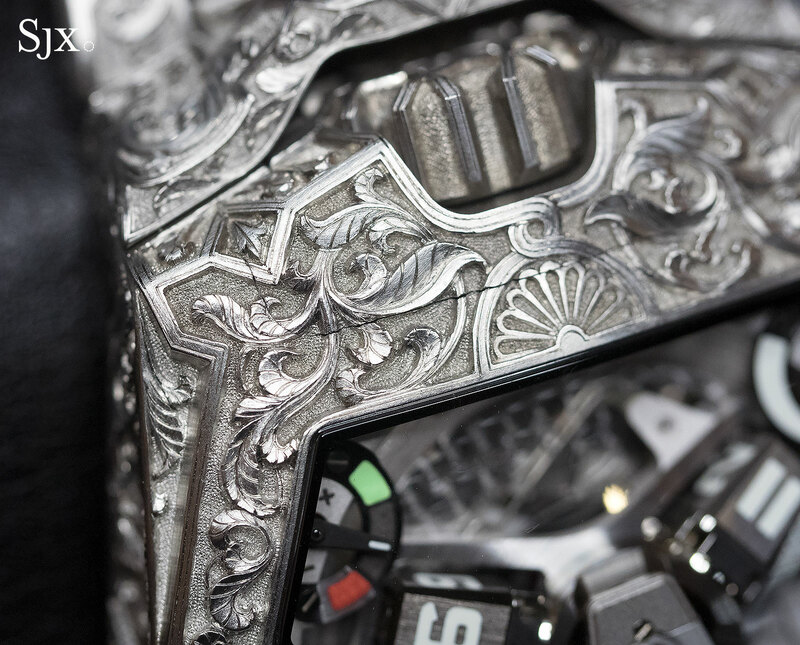 The decoration gives the watch a slightly medieval look; it would not look out of place as a prop on Game of Thrones. 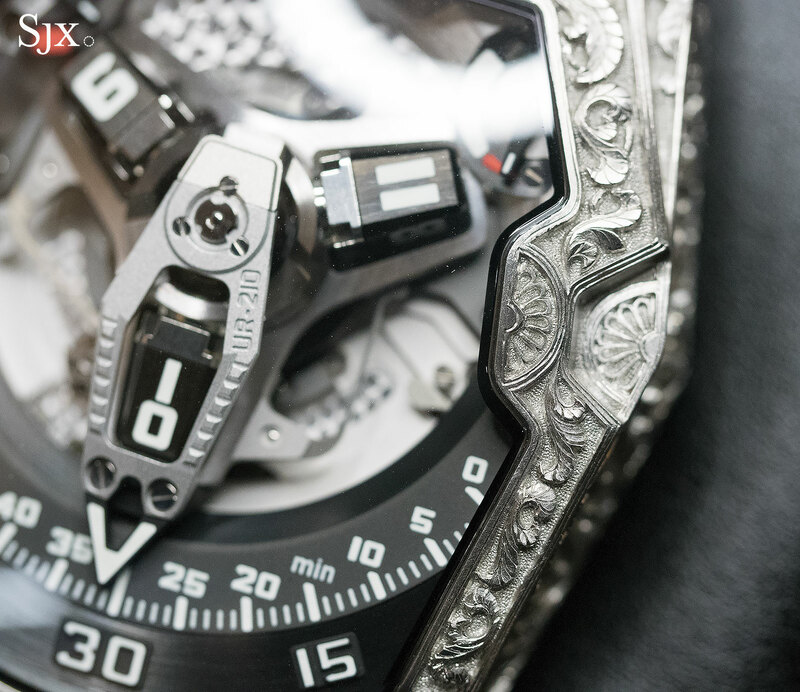 Requiring some 300 hours of engraving, it’s a remarkably impressive achievement, particularly given the scale of the engraving and the hardness of the material (which is steel for the case and bracelet). 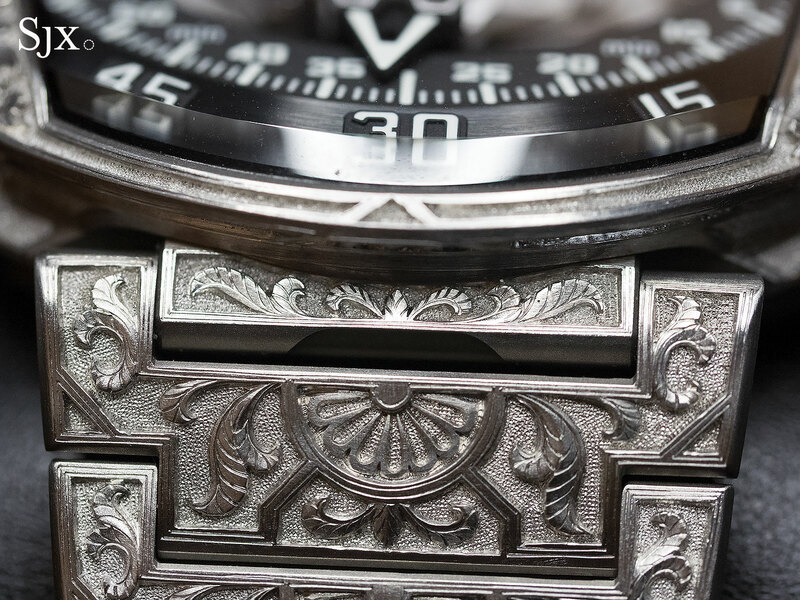 Practically every, literally every, surface of the watch has been covered in hand-engraving, right down to the crown guard at 12 o’clock and each individual link of the bracelet. Even the bead-blasted minute hand has been engraved; and that’s a shade lighter than the case, being aluminium instead of steel. Though certain elements are not as refined on that found on a gun, it is understandable given the minuscule canvas presented by the watch case, not to mention the curved and concave surfaces. Already a watch with tremendous presence on the wrist in its basic form – the case measures almost 54mm long – and even more sow with the matching steel bracelet, the UR-210 Dubai is hard to miss. 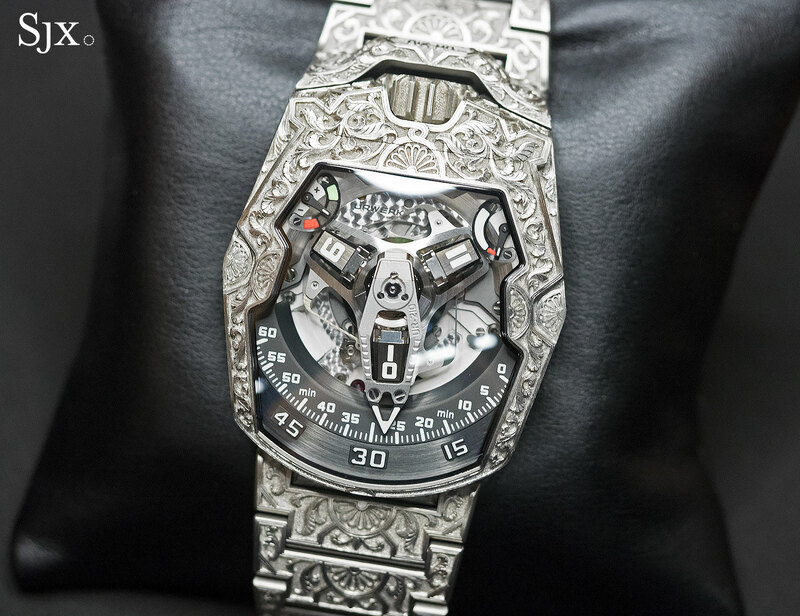 The Urwerk UR-210 Dubai is priced at AED840,000, or about US$229,000.